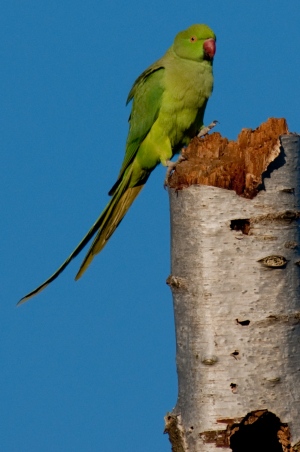 Observation - Ring Necked Parakeet - UK and Ireland. Description: Ventured out on a bright but cold day to Stockers Lake at Rickmansworth - the parakeets appeared to be checking out potential nesting sites. Ventured out on a bright but cold day to Stockers Lake at Rickmansworth - the parakeets appeared to be checking out potential nesting sites.